Value $380. • "U.S. NAVY SHIP OVERHAUL MARKET"—another invalu- able Navy sales tool also published by International Mari- time Associates, Inc. (IMA). This is a marketing guide to the $-multi-billion Navy ship repair and alteration program. 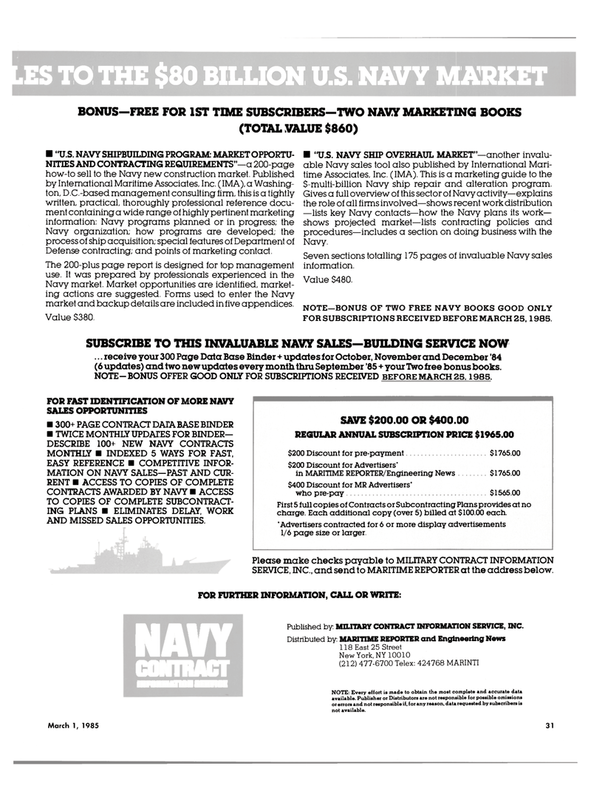 SUBSCRIBE TO THIS INVALUABLE NAVY SALES—BUILDING SERVICE NOW ... receive your 300 Page Data Base Binder + updates for October, November and December '84 (6 updates) and two new updates every month thru September '85 + your Two free bonus books. NOTE-BONUS OFFER GOOD ONLY FOR SUBSCRIPTIONS RECEIVED BEFORE MARCH 25,1985. First 5 full copies of Contracts or Subcontracting Plans provides at no charge. Each additional copy (over 5) billed at $100.00 each. 'Advertisers contracted for 6 or more display advertisements 1/6 page size or larger.